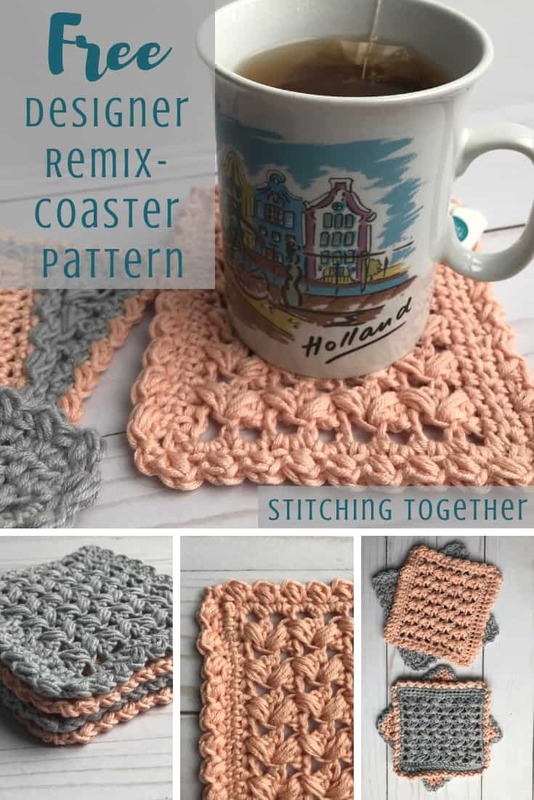 Welcome to the Designer Remix Series where you will find the One Cup at a Time Square Crochet Coasters remixed to add a little embellishment. Scroll down for all the details! Do you know what I am talking about and can you relate? Even if you haven’t braved the world of designing, I am guessing you’ve done a little this or that to a pattern to make it to your liking. One of my favorite things is to see how crocheters have added to my designs. In almost all of the finished versions of the Buffalo Plaid Baby Blanket that I have seen, the maker added a simple black border around the entire blanket! I love it. I started adding a border when I was working on it, but I love the rough edge of the spider stitch so much that I decided not to cover it. Now I get to enjoy seeing the blanket both ways! Others have added top stitching or tassels to the Cities Crochet Circle Bag which gives it some flair. I prefer plainer designs but that doesn’t mean you have to. Most designers won’t discourage you from embellishing their patterns and in the spirit of the fun, a bunch of designers decided we’d remix each other’s patterns and share them for the crochet community to enjoy. I have to say that this has been one of my most favorite projects of the year. It was so fun to look through other designs, so hard to choose, and so exciting to work with other designers. We had a couple of base rules: we had to keep the original pattern exactly the same and just add to it and just changing the yarn didn’t count as a remix. I’d also like to note that we did this fully with each other’s permission and are working together. You’ll still have to go to the original designer’s site to get the actual pattern and then come back here for the add on. 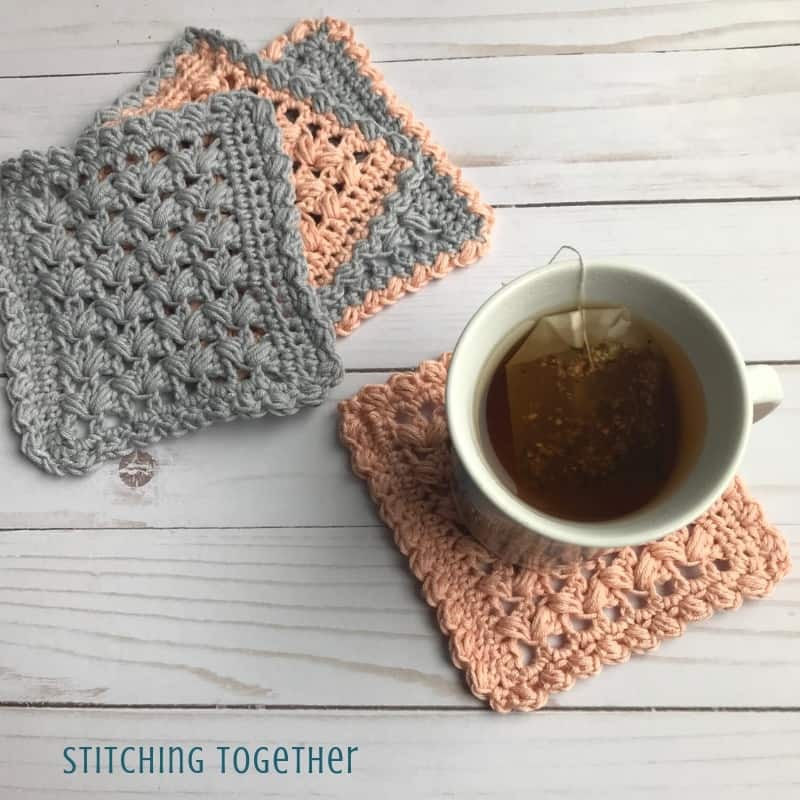 Save this Square Crochet Coaster Pattern on Pinterest! It is absolutely lovely and uses stitches in a way I hadn’t tried yet. It uses yarn I’ve been wanting to try. I could have used different yarn, but I’ve been wanting to use Premier Yarn Cotton Fair for awhile so this was a perfect opportunity. I bet you are ready to get started. 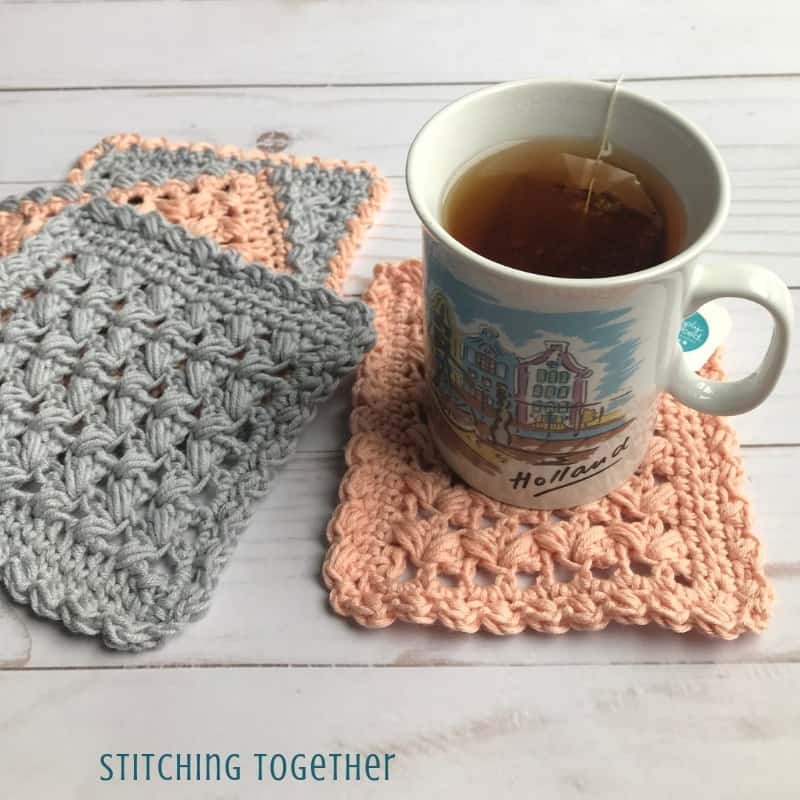 First head over to Christine’s blog, Sweet Potato 3 and follow the links to download the One Cup at a Time Coaster pattern. She has it available for download on both Ravelry and Craftsy for free! 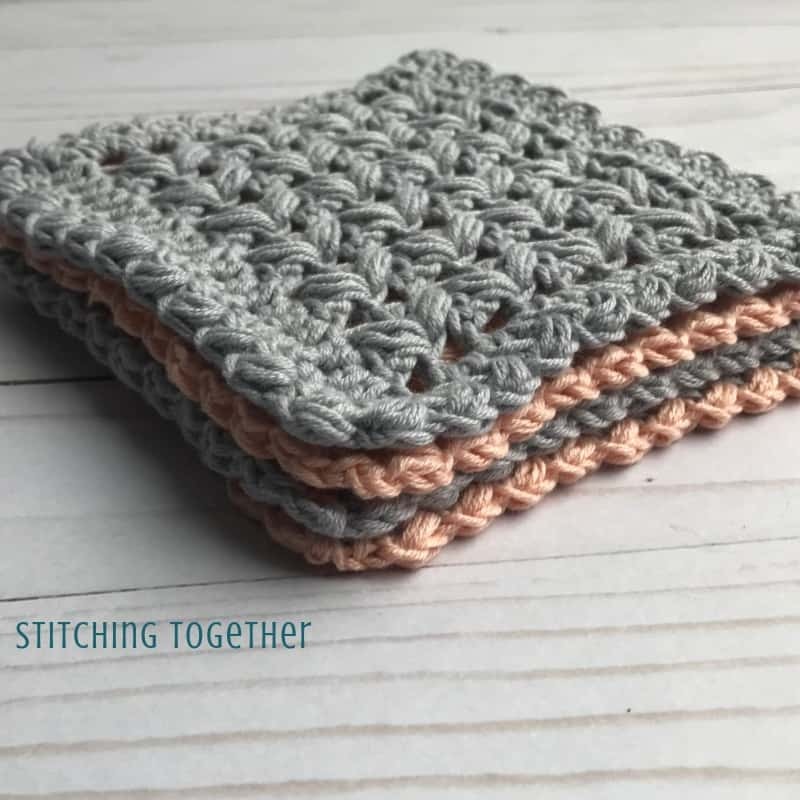 Once you’ve finished the pattern don’t fasten it off, but head back over here to check out the next steps for adding a fun and simple border that keeps with the feel of the original coasters. Small Puff Stitch – yo, insert hook into st, pull up loop, yo, insert hook into same st, pull up loop, yo and pull through all five loops on the hook. 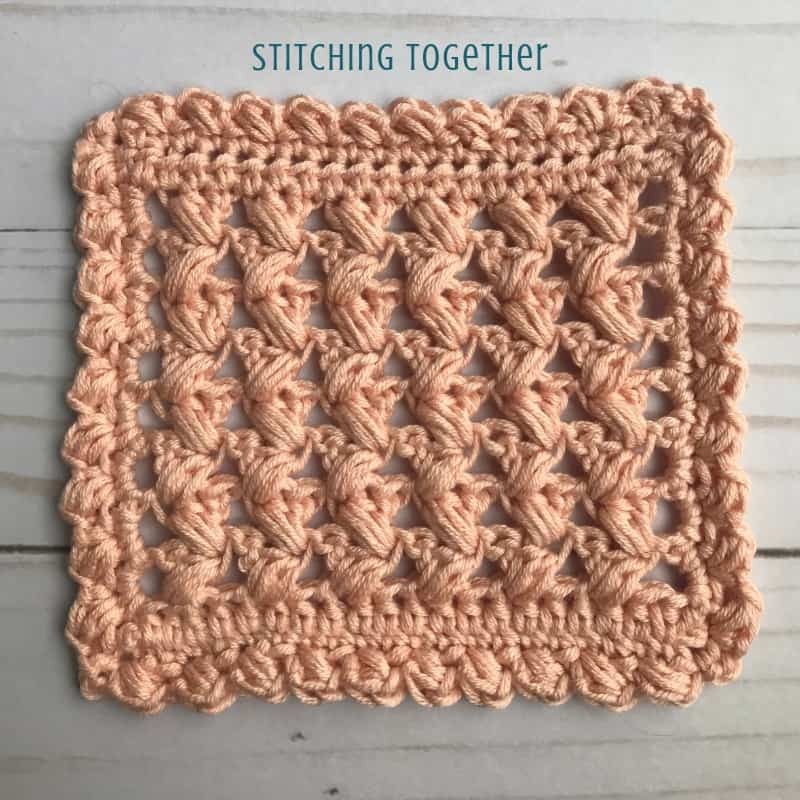 I didn’t count the chains which start the hdc rows as stitches so when you are adding the round of single crochets, only sc into the hdc which will give 20 sc across the top and bottom of the square coaster. 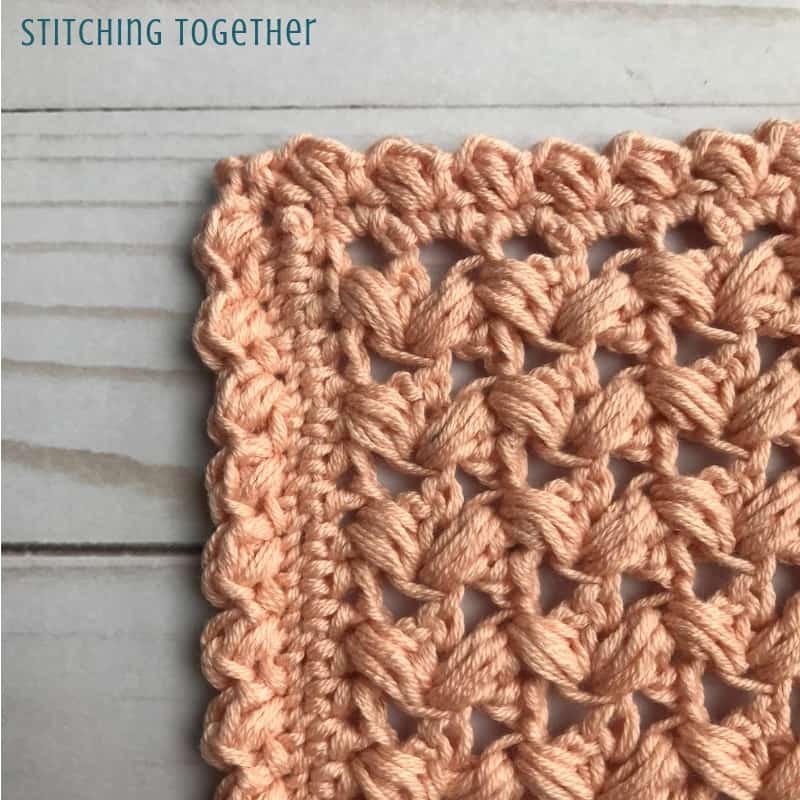 Round 2: ch 1, [*small puff stitch (see stitch instructions) in same stitch, ch 1, sk 1, sl st to next st, repeat from * to corner placing the last sl st into the ch-2 sp, ch 2, sl st to next st] repeat on all 4 sides joining with a sl st to the first small puff stitch. These coasters would make an absolutely lovely gift all stacked up and tied with a pretty bow! If you make them, I’d love it if you’d share with me. Head to the Stitching Together Community on FB and share this, or any other remix you’ve done! Also tag us with #CrochetDesignerRemix so you can join the remix fun!